We are very glad to inform you that LIMING Heavy Industry is participating in China International Aggregates Technology & Equipment Exhibition (2015)! 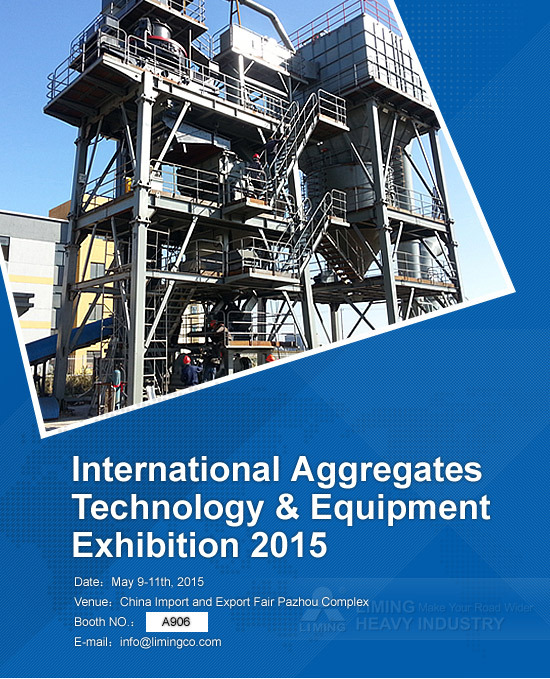 Jointly organized by China Aggregates Net and Guangdong Grandeur International Exhibition Group, China International Aggregates Technology & Equipment Exhibition 2015 will take place on May 9-11th. It is expected to attract 18000 buyers and professionals from 40-plus countries including Australia, Brazil, Russia, Malaysia, Singapore, Mexico, Indonesia, Romania, Slovakia, Sri Lanka, Syria, Venezuela, etc, to attend the show. LIMING Heavy Industry, as a standing member of China Sand-Stone Association and advanced manufacturing enterprises, will showcase its latest products of aggregate equipment. If you want to purchase our products and know more about them, please keep in mind that the Exhibition will be held on May 9-11 at China Import & Export Fair Pazhou Complex. Grand trade event, LIMING Heavy Industry is looking forward your participation.